I saw this candle the other day while strolling through the mall. 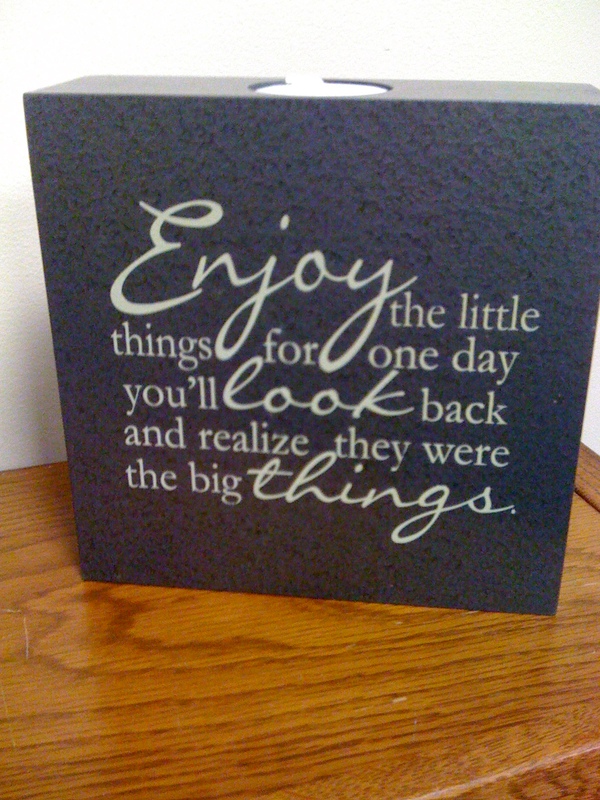 It says, “Enjoy the little things for one day you’ll look back and realize they were big things. This got my attention and made me think, because recently I have been watching old family video tapes as I’ve been converting them for dvd. Well, as I’ve watched these tapes of vacations and holidays, birthdays and the fourth of July through the years, I’m amazed at all the little things we did together. There were conversations between brothers, and kids riding Dad like a horse. I saw grandpas and grandmas sitting on the floor and reading books and quizzing kids on their numbers and letters. I saw a mom holding one, two, three, four different boys. In the middle of life, these were all little things. A million more of them happened but the escaped the eye of the video camera. And yet, now I see them and they are so big. These are the important things: conversations, playing, sitting and holding, listening and singing, fishing and even working together. Life and faith are experienced in those little things. And those little things become the big anchors of our lives. A little thing happened about 2,000 years ago. A baby was born to a mom and a dad. Almost everyone around was unaware of it because babies have always been born. In the history of the world it seemed like a little thing. But now we look back and see that it was a big thing! He was our Savior. He is our Lord. This season, instead of trying to make everything big or bigger, fill your days with little things. Take time to talk and listen. Enjoy a walk with a friend. Play a game with your kid. Read something together. Discover a new treat to share. If you need to, take a picture and you will see that someday in the not-to-distant future, it will become something big. Have a blessed Advent season and Christmas.